The almost four-year-long conflict in Yemen has brought the country to its knees. Every time I call my family back home in Yemen, my mother seems busy going to or coming back from a funeral. Today in Yemen, if air-strikes and shellings don’t kill you, the lack of food, medicine and water will. About twenty-two million people, that’s two-thirds of Yemen’s 29 million population are facing the world’s worst humanitarian crisis. In some parts of the country, people have turned to eating leaves to survive. Cholera and other infectious diseases continue to threaten millions of people amidst a collapsing health care system. More than ten thousand people have been killed or wounded (according to a UN report in 2016), and numerous human rights organizations and UN investigators have documented various war crimes committed in the country by all warring parties. As Yemen has turned into a ground of violations of International humanitarian, human rights and criminal laws, the state has ceased to exist. In an apocalyptic situation like this one, women and children are the first casualties of the conflict. According to UNICEF, a child dies every 10 minutes in Yemen because of preventable causes. Latest estimates show three million women and girls in Yemen are in acute need of protection and medical care. Over one million women are affected by malnourishment. Looming widespread famine threatens everyone in Yemen and little girls tend to be the most vulnerable ones. The war has led to a rise in child marriage cases and to a 63 per cent increase in violence against women. In a closer look into the death toll numbers in Yemen, these numbers seem contradictory as the UN itself estimated in 2016 that, “ten thousand people have been killed or wounded” and that, “a child dies every ten minutes”. The Washington Post explained once the obstacles against the UN counting the death toll, giving a clear hint that UN estimated numbers must have risen already. I was told by UNOCHA working in Yemen that female kids tend to be the most vulnerable and most malnutritioned - and child marriage has hit high rates. All this reflects how war is a gender issue. As the war affects women and girls, Yemeni women have both politically and militarily played a notable role. Back in 2011, when the revolution began in Yemen in light of the Arab Spring, women were the ones leading the uprising. Nobel laureate Tawakkol Karman is the most well-known example. The most significant achievement for women was in 2013 when the political transition process began, and women earned a quota of 30 percent representation in the National Dialogue Conference. But with the Houthi takeover in September 2014, and the Saudi-led coalition militarily intervention in 2015, the entire political progress in the country came to an end. During the various stages of the conflict, though, women were told to step aside every time they aimed to participate politically. For instance, in the first peace talks for Yemen in 2015 women were excluded. 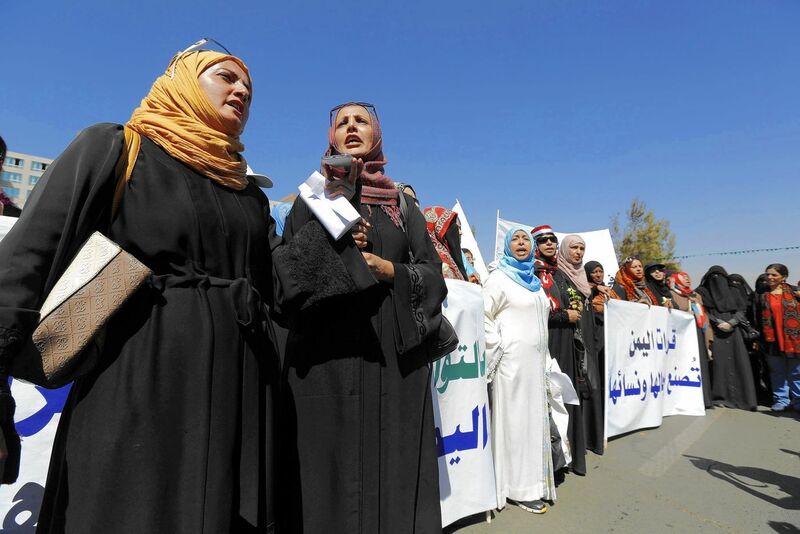 As a response, Women’s Pact for Peace and Security was formed by a group of Yemeni politicians and activists, a body that is endorsed by the UN Women. The group has not achieved any significant progress for women’s political participation as they still face reluctance from the Yemeni government officials to include women members in any political or peace process. Another important women’s grassroots group is "Mothers of Abductees Association", that was formed by female relatives of thousands of forcibly disappeared men in different parts of Yemen. The Association works as a pressure-group, raising awareness about the missing men, and advocating for their release. In Yemen, women’s military experiences have been varied. In the Houthi rebels-held, capital city of Yemen, Sana’a, women were recruited into the military by the rebels. The Houthis have opened training camps for women, creating a women military unit, what’s known as “Zeinabeyyat.” These female forces have been used in Houthis’ crackdown against women in peaceful public protests and demonstrations over the past three years. Recently, the “Zeinabeyyat” assisted in detainting women student protesters at a rally in front of Sana’a University. On the other opposite warring front, Taiz, a city in southwestern Yemen has been under siege by Houthi forces since the war began in 2015 and is today probably the most lawless and dangerous place in Yemen. Notably, women in Taiz have joined the resistance groups, periodically fighting the Houthis. The number of female soldiers is unknown as there are no reliable reports and statistics on the subject. It’s, however, believed to be a high number, mainly because military work has become a great source of income for many families in Yemen as the country’s economy has been collapsing since the war began. All warring parties allocate salaries for their militants. These female soldiers are not forced to fight, they are rather motivated to fight whether because of their economic needs or their ideological beliefs in the fight. The remarkable aspect is how these woman soldiers are used to detain other women. Given the social norms in the northern parts of Yemen of having a separation between the sexes and men not being allowed to touch women in public spaces, the military system has recruited women soldiers to storm into protests and detain them. The question remains why women in the course of Yemen’s war can play a military role but still can’t have a political say in how the conflict ends. Bearing in mind that even before the war began in Yemen, the country’s women had very poor political representation in the parliament even before the war (only two of 301 seats) while having a military role under the late former Yemeni president, Ali Abdullah Saleh. This skewed status of women has not changed with the war, even as their suffering has increased. However, women’s military role today occurs in the context of an oppressive system which recruits them specifically for oppressing other women. Given the collapse of Yemen’s economy and the fact that more than a million civil servants haven’t received their salaries, women and men alike have joined military factions as the war has become a source of income for fighters, as of course for those who keep the war going. The future of Yemen and the future of women depend greatly on how Yemeni women, individuals and groups, will fight for their political participation, especially for their role in any peace process to end the war. Yemeni women peace and political activists have been facing countless obstacles by most Yemeni men politicians and intellectuals. Systematic media smearing campaigns, removing women political activists from peace talks, and undermining the work of Women’s Pact for Peace and Security, all these are some of the proof that Yemeni women advocates have no male allies. The current only solidarity with these women is the Women’s Pact that’s supported by the UN Women. For that to happen, any and all forms of support and solidarity with these women from the international community matters to a great extent. Sweden is going to host next Yemen peace talks. When I met the Swedish ambassador to the UN Security Council weeks ago, he confirmed to me that Sweden is very keen to see women in the Yemen peace negotiation table and Sweden will continue to support the UN Women’s Yemeni women’s pact for peace and security. *This article was firstly written and published in Omvärlden.se, today.